This month we’re heading to New Zealand’s Hawke’s Bay region to discover what it offers expats. We consider climate, employment opportunities and the types of property you can get for your money. For this month’s area guide, we’re heading to region known as the North Island’s fruit bowl – Hawke’s Bay, a large area surrounding an 100km long bay on the south-east side of the Island. Perhaps the name rings a bell? If you’re a lover of a red wine, you’ll have seen the name Hawke’s Bay plastered across many-a-bottle of Merlot, Cab Sav, or Syrah. This is a beautiful, sunny part of the country, which offers residents plenty of opportunities to enjoy themselves and stay active in the great outdoors. 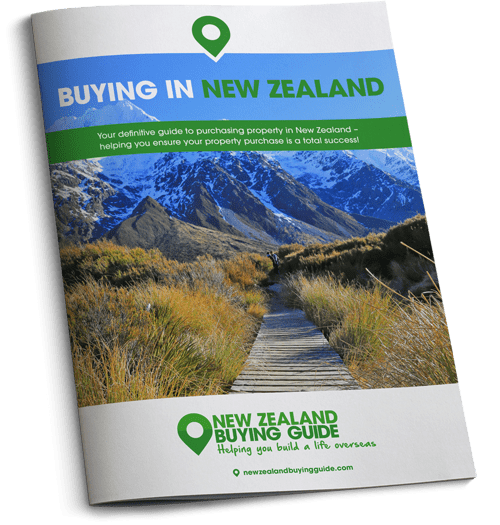 Today, we’re taking a closer look at Hawke’s Bay to see what it offers those of you still hunting for their ideal corner of the country. In Hawke’s Bay, you and your family will benefit from a healthy lifestyle, a safe environment and world-class education institutions. While it has plenty of competition from New Zealand’s other hotspots, Hawke’s Bay seems to us to be a real winner. This is one of New Zealand’s sunniest and driest locations, providing a wonderful setting for long days at the beach, exploring the countryside, or sampling the delights of the first stop on the Classic New Zealand Wine Trail. The area is also one of the country’s most environmentally friendly areas, and the Hastings district, the region’s largest, has been recently declared completely GM-free. In Hawke’s Bay, you and your family will benefit from a healthy lifestyle, a safe environment, world-class education institutions, and some of the country’s best food and drink. Hawke’s Bay is New Zealand’s art deco centre – the architecture is really something! If you’re a sucker for farmers markets and artisan produce, this region delivers – the area’s agricultural background ensures there’s always something tasty, fresh and healthy taking up space on your plate. Should you be keen to embark on a more active way of life, the forest trails of Kaweka and Ruahine Forest Parks, are great places to break in your new walking boots. If you’re a fan of cycling, The Big Easy Cycling Ride is a must-do. Golf fans will delight in the 20 golf courses found in the region, including Cape Kidnappers Golf Course, which is listed as one of the best courses in the world. Hawk’s Bay is world-famous for its red wine. Combine the reliably warm and sunny climate with great food and wine, and excellent architecture and you could almost be in the Mediterranean. Culture, sport, outdoor pursuits and dining out will become part of your day-to-day. The area has an excellent hospital, some of the country’s leading secondary schools, and if you fancied returning to university to study viticulture – the study of grapes – the Institute of Technology is internationally renowned. Hawke’s Bay hosts many events throughout the year, including the Art Deco Weekend, the Mission Estate Concert and the biggest celebration of Matariki (Maori New Year) in the whole country. Napier is an art deco gem of a town, surrounded by beaches and beautiful countryside. Hawke’s Bay is an agricultural hotspot, known for sheep and beef farming, cherries and apples, vegetables and of course grapes! Therefore, major industries involve forestry, food and beverage processing and manufacturing. Tourism is another key industry, built around the regions buildings and wineries. 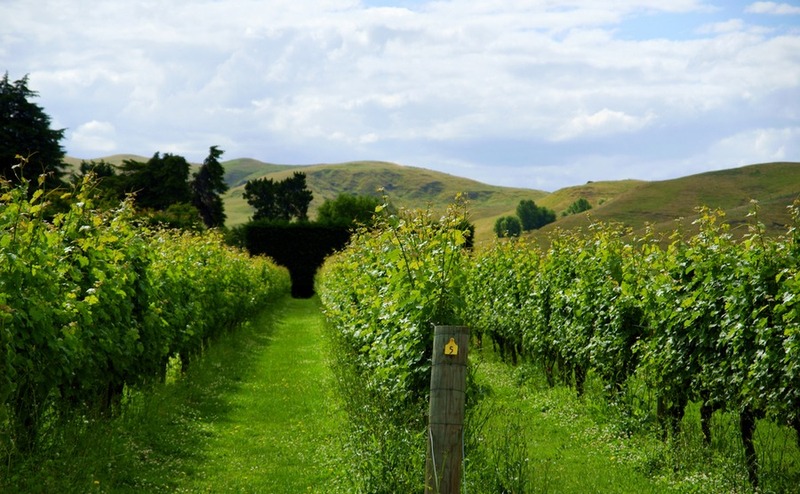 Hawke’s Bay enjoys a warm and generally dry climate. You can plan for an estimated 2000 or more hours of sunshine a year. In fact, Napier holds the record for the most sunshine hours in a year for a North Island centre. During summer, you should expect temperatures of between 19–24°C and during winter, between 10–15°C, but the southerly winds can make it seem colder. Rainfall is unpredictable – the area can experience droughts or heavy rains, which do sometimes result in flooding as much of the farmland is low-lying. This art deco gem of a town with a population of around 57,000 is surrounded by beaches and beautiful countryside. From your window, you’ll enjoy views of rolling green hills, the Pacific Ocean, vineyards and palm trees. This three-bedroom family home is conveniently located close to Napier’s main hangouts and is on the market for $730,000(£377,650). 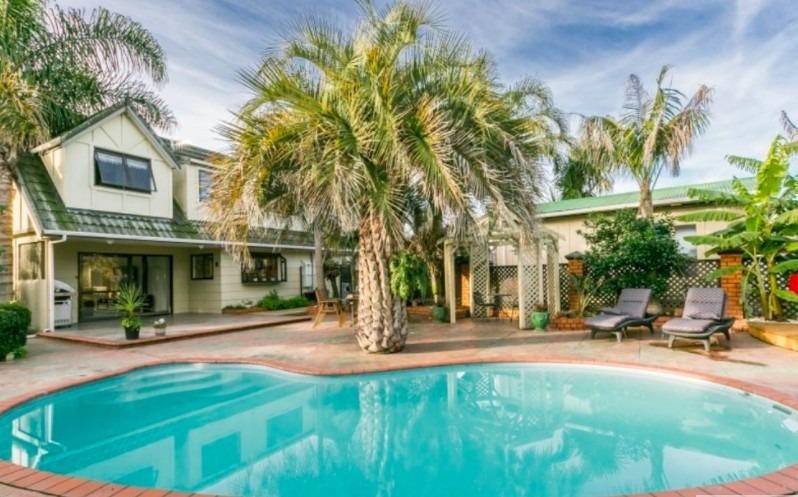 The property has its own pool and sundeck area complete with palm trees, a self-contained cottage in the garden and an office in a separate building. Hastings, Hawke’s Bay’s other major urban area, has a population of around 70,000 and is just 11 miles from Napier. This is another place that combines beach-side living with food, drink and an outdoor lifestyle. Orchards and vineyards surround the town, meaning every market stall, farmers market, café and restaurant is serving up fresh, locally-grown produce. This three-bedroom Art Deco property is close to all of Hasting’s amenities. The property has been given a recent paint-job, natural timber floors throughout and two fantastic outdoor entertaining areas. The property is on the market for $335,000 (£173,200). 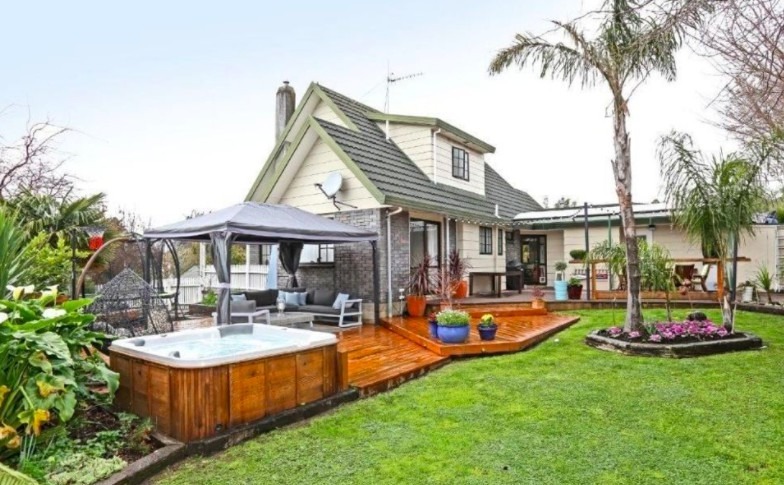 For a more-villagey vibe, look to Havelock North close to Hastings. This area is full of tree-lined streets, cute cafés, restaurants known for serving hearty, country fare and boutique shops. Havelock North has an arty community, so expect to enjoy lots cultural events, art shows and gallery openings. 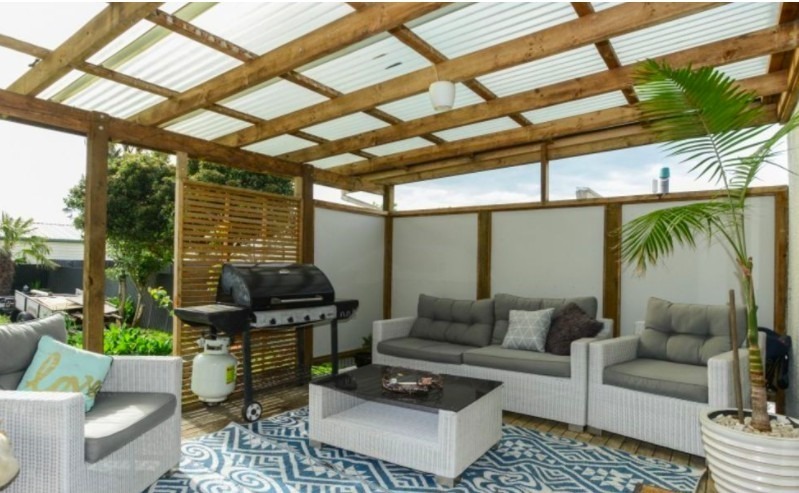 This spacious three-bedroom property has a sunny state-of-the-art kitchen and plenty of space for entertaining, including your own spa pool and outdoor entertainment area. The open-plan property has two gas fires for the cooler months. This property is on the market for $651,000 (£337,000).